Troy R. Bennett | BDN Gov. Janet Mills speaks at a press conference in Portland on Feb. 21. Some legislative committees have finished their recommendations on Gov. 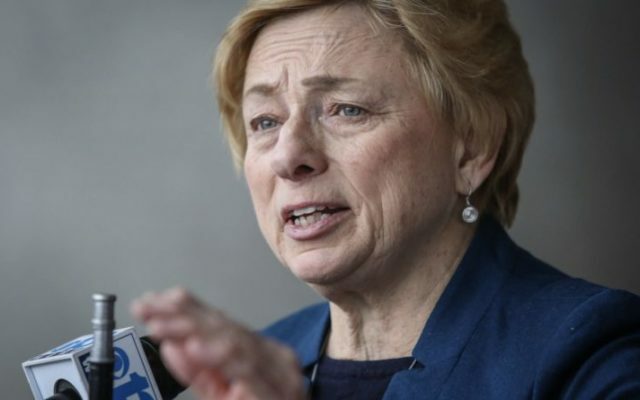 Janet Mills’ $8 billion, two-year budget proposal, with Democrats asking for more education funding and Republicans splitting with them on many key initiatives. The vast majority of the budget lines — as usual — are non-controversial, but the real work will be done between now and June as the budget-writing committee sorts through recommendations and resolves tension on the Democratic governor’s left and right. Democrats on the education committee want to fund 55 percent of essential local school costs. That won’t be easy. Progressives largely wanted more from Mills’ budget proposal, which was restricted somewhat by her 2018 campaign pledge not to raise taxes. Instead, she rankled Republicans by floating a $8 billion plan that proposed spending all but $383,000 of the anticipated revenue for the next two fiscal years. When taken together with a supplemental budget approved by lawmakers, the proposal would be $5 million in the negative by 2021. That is going to have to be addressed by a Legislature that must pass a balanced budget, but it highlights the sensitivity of the proposal on the margins. The Democratic majority of the education committee proposed to fund 55 percent of local education costs, a voter-approved threshold that the state has never met and would cost $200 million more than a K-12 increase of $126 million over two years proposed by Mills. Republicans on the panel split with Democrats to back Mills’ increase as drafted. They also backed the governor’s proposal to combine teacher retirement costs with general school aid for budget purposes, while Democrats want to break those budget lines apart. The parties also have two different ways of addressing Mills’ proposal to raise minimum teacher salaries from $30,000 to $40,000. Democrats want to provide 100 percent of the incremental costs of that in the first year, 66 percent in the second year and 33 percent in the third, which would leave local districts to share costs. Republicans want a statewide teacher contract. Republicans and one Democrat didn’t want to raid the tobacco settlement fund to create a reserve fund for Medicaid expansion costs. There are also some divisions on the budget of the Department of Health and Human Services, the biggest state agency. Chief among them are how the state’s share of Medicaid expansion costs is backstopped. Mills included $146 million in her budget to fund expansion, which is roughly in line with a past estimate from the Legislature’s fiscal office. However, it is backed by a $29 million reserve fund stocked with one-time tobacco settlement money that would pay for cost overruns. A majority of Democrats on the panel overseeing the department largely backed that plan from Mills, while Republicans and Sen. Ned Claxton, D-Auburn, a physician, opposed moving the money from the tobacco settlement fund. Sen. Marianne Moore, R-Calais, voted with Democrats to back Mills’ proposals to repeal a provision denying people for a cash assistance program upon a failed drug test and increase reimbursement rates for methadone clinics. Other Republicans opposed those items. It all sets up a nuanced debate down the home stretch of budget negotiations. Democrats hold the keys to most of what goes on in Augusta this year, but Republicans will have to assent to a budget that needs two-thirds approval in both chambers under normal circumstances. There will be tensions between Democrats who want to spend more, Republicans who want to spend less and a governor who is in between them on many issues. It’ll be a typically slow Friday in the State House complex, with only a few legislative committees starting and likely ending early. Three committees will meet to discuss bills that would provide more financial supports to elderly Mainers, promote composting, reduce the amount of municipal solid waste, and maintain the state’s landfilling capacity while promoting recycling. Labor and Housing Committee members could vote on a bill from Rep. Chris Kessler, D-South Portland, that would increase the notification time period a landlord must give a tenant if the landlord is going to raise the rent or terminate a tenant at will. The committee will consider another bill from Sen. Lisa Keim, R-Dixfield, that would allow employers to test employees or applicants for certain prescription drugs, including fentanyl, hydromorphone, hydrocodone and oxycodone. Listen here. — More problems with Maine’s indigent legal services program have been identified. A report presented Thursday to lawmakers highlighted questionable oversight, high bills from some attorneys and potential conflicts of interest in the program, which has long suffered from funding challenges. The study of the system by the Sixth Amendment Center recommends changes to the system, including raising hourly fees to $100 and paying more for murder and other cases. — Having trouble keeping track of all the bureaucratic zigs and zags related to Central Maine Power’s proposed hydropower corridor?Multiple agencies are diving into permitting issues, and the Legislature also wants a say. Click here for an overview of what to expect from the regulatory and legislative processes. — Murder charges have been filed in the case of a 2-year-old’s death in 2017. Police on Thursday arrested Savannah Smith, 21, in Bucksport after she was indicted on a murder charge earlier Thursday by a Hancock County grand jury.She is accused of killing Kloe Hawksley on Oct. 18, 2017.Smith was the partner of Tyler Hawksley, the child’s father, at the time of the child’s death, according to police. The first time I read John Updike was at night in New Orleans. It was about a month after he died, and I was a junior in college visiting the city for the first time. I was sitting outside at Cafe du Mondé around 9 p.m, drinking a café au lait and eating a beignet, reading excerpts of his writing in the New Yorker’s memorial issue. I still have that issue in a stack somewhere in my apartment, and the pages are crunchy from powdered sugar. I’ve been back to the city probably five times since then, but those visits aren’t as defined in my mind as the first. At the time, I was keen on rolling my own cigarettes, so, once I left the cafe, my mind buzzing with a lot of overly earnest emotions, I walked to get some rolling papers and loose tobacco so I could smoke and take a walk. I met up with my friend Rush, and we read some of those Updike excerpts aloud while we sat on his friend’s porch and ate kumquats from a tree growing next to the house. Later that week, we went dumpster diving behind one of the organic groceries with his friend and managed to find all of the ingredients to make a sausage gumbo, (we actually purchased the sausage) which we did in a large pot in his kitchen. It partly makes me cringe to think about it now, because of how precious it all was. But, as we tend to be in our early 20s, I was very in love with full feelings and new experiences. To reach us, email us directly at mshepherd@bangordailynews.com, aacquisto@bangordailynews.com and rlong@bangordailynews.com.